Halcyon Yarn ... For over 40 years! 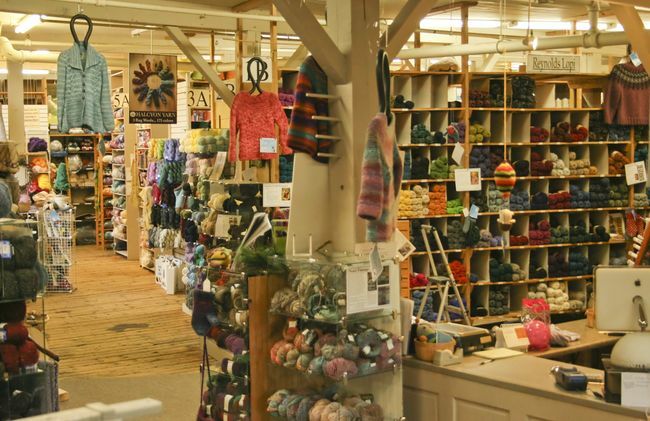 2011 marked 40 years of Halcyon Yarn bringing yarn and fiber arts supplies to thousands of wonderful customers throughout the world - and we've been serving you from our location here in beautiful Bath, Maine for over 30 years now. Yes, there is a real Halcyon! 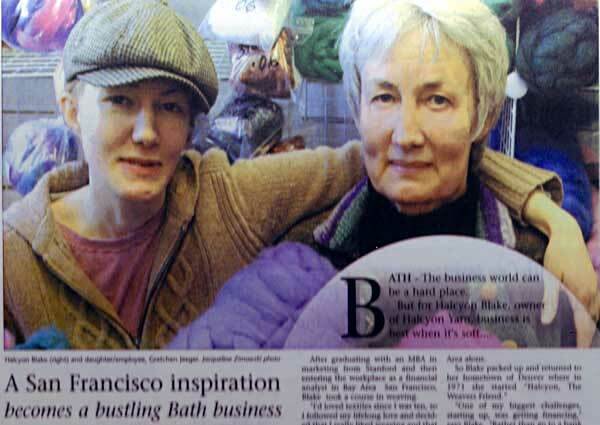 I'm Halcyon Blake, founder and president of Halcyon Yarn. Halcyon is a family name - it was my grandmother's and my aunt's name as well. The origins of the name Halcyon and the term "Halcyon Days" are found in Greek mythology. Halcyon (daughter of the god of the wind) was the wife of Ceyx who drowned at sea. Grief stricken the widow threw herself into the sea after him. The gods took pity on them and transformed Halcyon and her drowned husband into kingfisher birds. Together they made their nest on the water during the brief period of calm surrounding the Winter Solstice. These few days of calm winds and gentle seas are known as the "Halcyon Days" and the kingfisher is their symbol - we’ve adopted this beautiful bird as our symbol too... because doesn’t working with fiber make you feel calm and peaceful? Buy Local - Halcyon Yarn on WPXT TV from Halcyon Yarn on Vimeo. I have been sewing since the age of ten and knitting since high-school - yes, I still have that red mohair cable knit cardigan! Then in college - like so many fellow 60's hippy chicks - I learned to weave and fell in love with it. After graduating in 1969 from Stanford University’s Graduate School of Business as one of three women in a class of over 250 students I decided to combine my new found passion for weaving with my still-untested business skills. 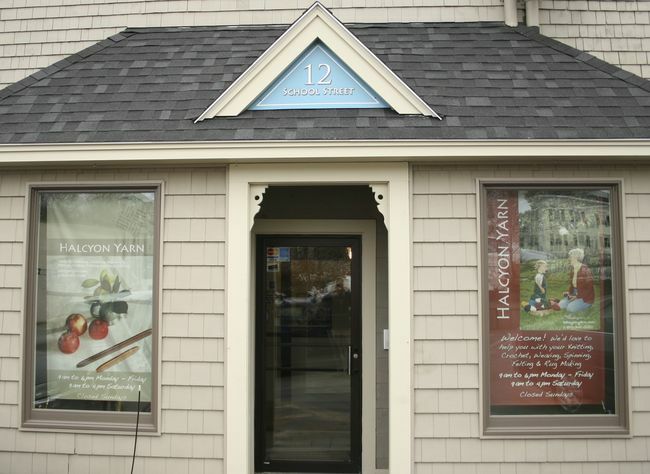 I opened Halcyon Yarn in 1971 with the help of my older sister Sara and my future husband Hector. Although the inspiration and research for the store began in San Francisco when we finally opened our doors in 1971 we did so back in my hometown of Denver, Colorado. There we opened a small walk-in store serving weavers and other yarn lovers from needlepointers to macramé enthusiasts. 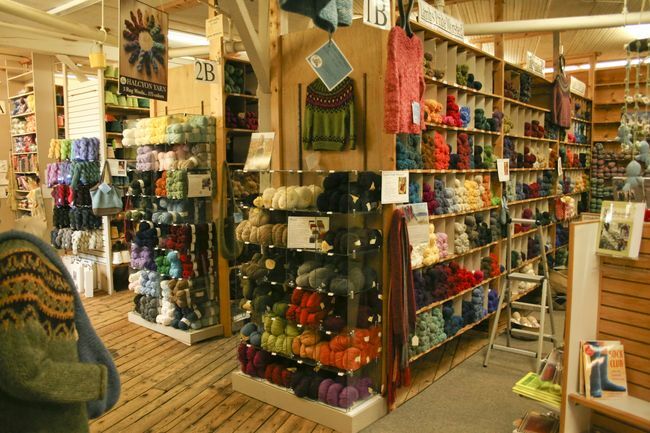 In 1978 we began selling the Yarn Store in a Box™ as a way to bring yarn to customers throughout the Rocky Mountains who had visited the store, but wanted to purchase by phone. By 1981 mail order already accounted for a fair number of our sales and it was once again time for a change! After 10 great years in Denver we decided to move to the East Coast to be closer to my husband’s family and the ocean. 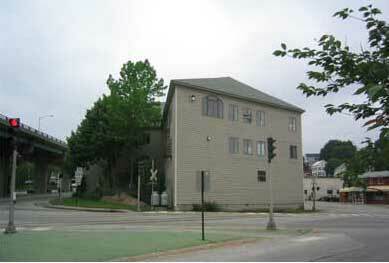 For our new headquarters and home we found an old warehouse building, formerly a garment factory for the Besse Company, in the small coastal city of Bath, Maine and our Eastward journey began. 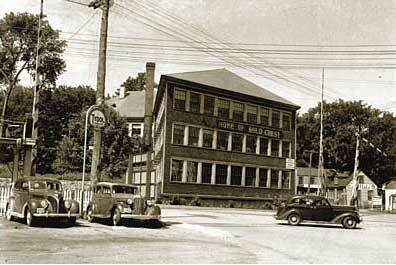 Pictured top, circa 1940 and it looked just like that when we arrived in 1981. Pictured bottom, present. We held a big Farewell to Denver Sale, packed our inventory and our pickup truck into a forty foot trailer, put the car seat in the car and brought our baby Gretchen and our dachshund Rudy to our new home in the 80 year old, three story wood frame Mikelsky Building. During the first couple of weeks in our new location we operated in an unlit space using just daylight and flashlights to build shelving, stock shelves and to get our first orders out the door. Our first computer was still three or four years away and credit cards were only a glimmer in someone's eye. All our records were kept on paper and we hand-wrote ledger sheets every night for all our mail order customers. Amazingly we were up and running and our first shipment was out the door only two weeks after leaving Denver! During that first year in Maine we signed up for the new "800" telephone service which allowed customers to call toll-free and we hired two employees to keep up with our growing sales, virtually all of which were mail order. 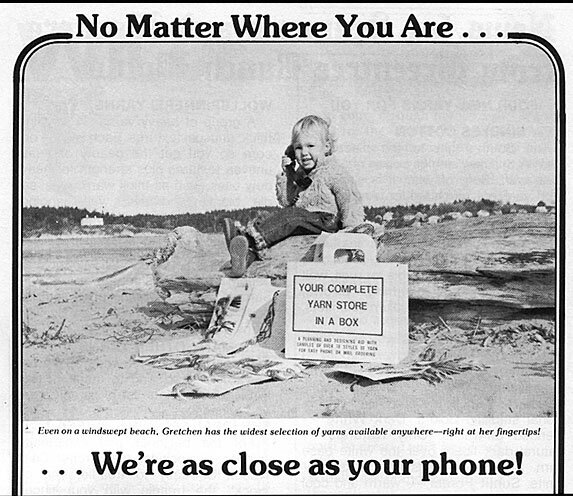 Our first ad after coming to Maine was a picture of Gretchen sitting on Popham Beach, telephone in hand and ready to take orders! For the next ten years we continued to steadily add employees and to ship Yarn Store in a Box© collections all over the world. In the early nineties we opened our doors to the public as a regular store front in addition to our mail order sales and we were up to eleven hard working employees! In 1995 we improved our catalogues by publishing our first full color edition to compliment the Yarn Store in a Box®. In 1996 we launched our website and have since fulfilled orders for over 80,000 customers. * Support for artists and educators & the growth of art and handcrafts everywhere. * Care for the environment. * Local & global community involvement. * Personal and professional integrity, quality & creativity. * Innovative and enduring products and services. * Educational opportunities for artists and all our staff. Halcyon Yarn is committed to offering the highest quality products and services and we are always looking for opportunities to improve our selection. 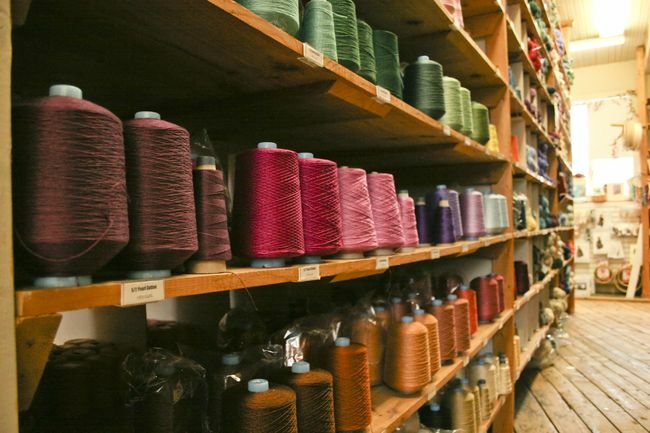 We've found or encouraged new suppliers to create interesting tools and with your input created the exclusive yarns and color lines born from hand-dyeing in our back yard in Denver. Now we have these signature yarns specially spun to find just the right qualities and palettes. These Halcyon Yarn signature lines compliment the other fine yarns and tools we select from suppliers here in Maine, and throughout America, Europe, Asia, Africa and South America. Halcyon Yarn Feature from Destination Bath, Version 2 from Halcyon Yarn on Vimeo.